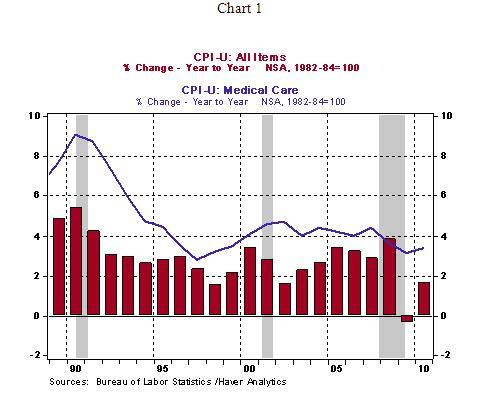 Historical trends of the Consumer Price Index (CPI) and the medical care components in the CPI are useful to assess some aspects of the Medicare proposal in the Paul Ryan budget. In the past 20 years, the medical care component of CPI has consistently risen faster than the CPI, with the exception of 2008 (see Chart 1). The Ryan budget proposal would end Medicare as we know it today. The federal government would provide premium support for each beneficiary reaching 65 years of age in 2022 to purchase private health insurance in place of the current Medicare program. Premium support would be raised each year in line with the change in the Consumer Price Index. Premium support is means tested such that beneficiaries in the upper quartiles of income distribution would receive less support compared with those in the lower quartiles. As noted earlier, if medical care costs have advanced faster than the CPI in the past twenty years, the probability of it matching the change in CPI in the future is small. Sharp growth of Medicare expenses in the years ahead is from significant projected growth in costs of medical services (physician costs and hospital expenses). The growth rate of these costs has to be contained to cap the escalation of projected medical costs. Until this trend is reversed, premium adjustments will be inadequate and beneficiaries would bear a larger burden of health care expenses than under the current Medicare program. Effectively, the Medicare reform in the proposal does not offer a solution to contain projected growth in medical expenses but presents a way to reduce federal budget outlays by restricting federal spending to the cost of medical insurance premium adjustments and change in the CPI in the future. This aspect of the proposal reduces uncertainty associated with medical costs in the future federal budget but it transfers the uncertainty to future beneficiaries. These facts are food for thought for one and all.